"Business form" redirects here. For types of business entities, see List of business entities. Corporate law (also known as business law or enterprise law or sometimes company law) is the body of law governing the rights, relations, and conduct of persons, companies, organizations and businesses. It refers to the legal practice relating to, or the theory of corporations. Corporate law often describes the law relating to matters which derive directly from the life-cycle of a corporation. It thus encompasses the formation, funding, governance, and death of a corporation. While the minute nature of corporate governance as personified by share ownership, capital market, and business culture rules differ, similar legal characteristics - and legal problems - exist across many jurisdictions. Corporate law regulates how corporations, investors, shareholders, directors, employees, creditors, and other stakeholders such as consumers, the community, and the environment interact with one another. Whilst the term company or business law is colloquially used interchangeably with corporate law, business law often refers to wider concepts of commercial law, that is, the law relating to commercial or business related activities. In some cases, this may include matters relating to corporate governance or financial law. When used as a substitute for corporate law, business law means the law relating to the business corporation (or business enterprises), i.e. capital raising (through equity or debt), company formation, registration, etc. Delegated management under a board structure; the board of directors delegates day-to-day management of the company to executives. Widely available and user-friendly corporate law enables business participants to possess these four legal characteristics and thus transact as businesses. Thus, corporate law is a response to three endemic opportunism: conflicts between managers and shareholders, between controlling and non-controlling shareholders; and between shareholders and other contractual counterparts (including creditors and employees). A corporation may accurately be called a company; however, a company should not necessarily be called a corporation, which has distinct characteristics. In the United States, a company may or may not be a separate legal entity, and is often used synonymous with "firm" or "business." According to Black's Law Dictionary, in America a company means "a corporation — or, less commonly, an association, partnership or union — that carries on industrial enterprise." Other types of business associations can include partnerships (in the UK governed by the Partnership Act 1890), or trusts (Such as a pension fund), or companies limited by guarantee (like some community organizations or charities). Corporate law deals with companies that are incorporated or registered under the corporate or company law of a sovereign state or their sub-national states. The defining feature of a corporation is its legal independence from the shareholders that own it. Under corporate law, corporations of all sizes have separate legal personality, with limited or unlimited liability for its shareholders. Shareholders control the company through a board of directors which, in turn, typically delegates control of the corporation's day-to-day operations to a full-time executive. Shareholders' losses, in the event of liquidation, are limited to their stake in the corporation, and they are not liable for any remaining debts owed to the corporation's creditors. This rule is called limited liability, and it is why the names of corporations end with "Ltd.". or some variant such as "Inc." or "plc"). Under almost all legal systems[which?] corporations have much the same legal rights and obligations as individuals. In some jurisdictions, this extends to allow corporations to exercise human rights against real individuals and the state, and they may be responsible for human rights violations. Just as they are "born" into existence through its members obtaining a certificate of incorporation, they can "die" when they lose money into insolvency. Corporations can even be convicted of criminal offences, such as corporate fraud and corporate manslaughter. In order to understand the role corporate law plays within commercial law, it is useful to understand the historical development of the corporation, and the development of modern company law. Although some forms of companies are thought to have existed during Ancient Rome and Ancient Greece, the closest recognizable ancestors of the modern company did not appear until the 16th century. With increasing international trade, Royal charters were granted in Europe (notably in England and Holland) to merchant adventurers. The Royal charters usually conferred special privileges on the trading company (including, usually, some form of monopoly). Originally, traders in these entities traded stock on their own account, but later the members came to operate on joint account and with joint stock, and the new Joint stock company was born. Early companies were purely economic ventures; it was only a belatedly established benefit of holding joint stock that the company's stock could not be seized for the debts of any individual member. The development of company law in Europe was hampered by two notorious "bubbles" (the South Sea Bubble in England and the Tulip Bulb Bubble in the Dutch Republic) in the 17th century, which set the development of companies in the two leading jurisdictions back by over a century in popular estimation. Companies, almost inevitably, returned to the forefront of commerce, although in England to circumvent the Bubble Act 1720 investors had reverted to trading the stock of unincorporated associations, until it was repealed in 1825.[relevant? – discuss] However, the cumbersome process of obtaining Royal charters was simply insufficient to keep up with demand. In England there was a lively trade in the charters of defunct companies. However, procrastination amongst the legislature meant that in the United Kingdom it was not until the Joint Stock Companies Act 1844 that the first equivalent of modern companies, formed by registration, appeared. Soon after came the Limited Liability Act 1855, which in the event of a company's bankruptcy limited the liability of all shareholders to the amount of capital they had invested. The beginning of modern company law came when the two pieces of legislation were codified under the Joint Stock Companies Act 1856 at the behest of the then Vice President of the Board of Trade, Mr Robert Lowe. That legislation shortly gave way to the railway boom, and from there the numbers of companies formed soared. In the later nineteenth century depression took hold, and just as company numbers had boomed, many began to implode and fall into insolvency. Much strong academic, legislative and judicial opinion was opposed to the notion that businessmen could escape accountability for their role in the failing businesses. The last significant development in the history of companies was the decision of the House of Lords in Salomon v. Salomon & Co. where the House of Lords confirmed the separate legal personality of the company, and that the liabilities of the company were separate and distinct from those of its owners. The proprietary limited company is a statutory business form in several countries, including Australia. Many countries have forms of business entity unique to that country, although there are equivalents elsewhere. Examples are the limited liability company (LLC) and the limited liability limited partnership (LLLP) in the United States. Other types of business organizations, such as cooperatives, credit unions and publicly owned enterprises, can be established with purposes that parallel, supersede, or even replace the profit maximization mandate of business corporations. a company limited by guarantee. Commonly used where companies are formed for non-commercial purposes, such as clubs or charities. The members guarantee the payment of certain (usually nominal) amounts if the company goes into insolvent liquidation, but otherwise they have no economic rights in relation to the company . a company limited by guarantee with a share capital. A hybrid entity, usually used where the company is formed for non-commercial purposes, but the activities of the company are partly funded by investors who expect a return. a company limited by shares. The most common form of company used for business ventures. an unlimited company either with or without a share capital. This is a hybrid company, a company similar to its limited company (Ltd.) counterpart but where the members or shareholders do not benefit from limited liability should the company ever go into formal liquidation. There are, however, many specific categories of corporations and other business organizations which may be formed in various countries and jurisdictions throughout the world. One of the key legal features of corporations are their separate legal personality, also known as "personhood" or being "artificial persons". However, the separate legal personality was not confirmed under English law until 1895 by the House of Lords in Salomon v. Salomon & Co. Separate legal personality often has unintended consequences, particularly in relation to smaller, family companies. In B v. B  Fam 181 it was held that a discovery order obtained by a wife against her husband was not effective against the husband's company as it was not named in the order and was separate and distinct from him. And in Macaura v. Northern Assurance Co Ltd a claim under an insurance policy failed where the insured had transferred timber from his name into the name of a company wholly owned by him, and it was subsequently destroyed in a fire; as the property now belonged to the company and not to him, he no longer had an "insurable interest" in it and his claim failed. Historically, because companies are artificial persons created by operation of law, the law prescribed what the company could and could not do. Usually this was an expression of the commercial purpose which the company was formed for, and came to be referred to as the company's objects, and the extent of the objects are referred to as the company's capacity. If an activity fell outside the company's capacity it was said to be ultra vires and void. By way of distinction, the organs of the company were expressed to have various corporate powers. If the objects were the things that the company was able to do, then the powers were the means by which it could do them. Usually expressions of powers were limited to methods of raising capital, although from earlier times distinctions between objects and powers have caused lawyers difficulty. Most jurisdictions have now modified the position by statute, and companies generally have capacity to do all the things that a natural person could do, and power to do it in any way that a natural person could do it. However, references to corporate capacity and powers have not quite been consigned to the dustbin of legal history. In many jurisdictions, directors can still be liable to their shareholders if they cause the company to engage in businesses outside its objects, even if the transactions are still valid as between the company and the third party. And many jurisdictions also still permit transactions to be challenged for lack of "corporate benefit", where the relevant transaction has no prospect of being for the commercial benefit of the company or its shareholders. As artificial persons, companies can only act through human agents. The main agent who deals with the company's management and business is the board of directors, but in many jurisdictions other officers can be appointed too. The board of directors is normally elected by the members, and the other officers are normally appointed by the board. These agents enter into contracts on behalf of the company with third parties. Although the company's agents owe duties to the company (and, indirectly, to the shareholders) to exercise those powers for a proper purpose, generally speaking third parties' rights are not impugned if it transpires that the officers were acting improperly. Third parties are entitled to rely on the ostensible authority of agents held out by the company to act on its behalf. A line of common law cases reaching back to Royal British Bank v Turquand established in common law that third parties were entitled to assume that the internal management of the company was being conducted properly, and the rule has now been codified into statute in most countries. Accordingly, companies will normally be liable for all the act and omissions of their officers and agents. This will include almost all torts, but the law relating to crimes committed by companies is complex, and varies significantly between countries. Corporate governance is primarily the study of the power relations among a corporation's senior executives, its board of directors and those who elect them (shareholders in the "general meeting" and employees), as well as other stakeholders, such as creditors, consumers, the environment and the community at large. One of the main differences between different countries in the internal form of companies is between a two-tier and a one tier board. The United Kingdom, the United States, and most Commonwealth countries have single unified boards of directors. In Germany, companies have two tiers, so that shareholders (and employees) elect a "supervisory board", and then the supervisory board chooses the "management board". There is the option to use two tiers in France, and in the new European Companies (Societas Europaea). Recent literature, especially from the United States, has begun to discuss corporate governance in the terms of management science. While post-war discourse centred on how to achieve effective "corporate democracy" for shareholders or other stakeholders, many scholars have shifted to discussing the law in terms of principal–agent problems. On this view, the basic issue of corporate law is that when a "principal" party delegates his property (usually the shareholder's capital, but also the employee's labour) into the control of an "agent" (i.e. the director of the company) there is the possibility that the agent will act in his own interests, be "opportunistic", rather than fulfill the wishes of the principal. Reducing the risks of this opportunism, or the "agency cost", is said to be central to the goal of corporate law. The rules for corporations derive from two sources. These are the country's statutes: in the US, usually the Delaware General Corporation Law (DGCL); in the UK, the Companies Act 2006 (CA 2006); in Germany, the Aktiengesetz (AktG) and the Gesetz betreffend die Gesellschaften mit beschränkter Haftung (GmbH-Gesetz, GmbHG). The law will set out which rules are mandatory, and which rules can be derogated from. Examples of important rules which cannot be derogated from would usually include how to fire the board of directors, what duties directors owe to the company or when a company must be dissolved as it approaches bankruptcy. Examples of rules that members of a company would be allowed to change and choose could include, what kind of procedure general meetings should follow, when dividends get paid out, or how many members (beyond a minimum set out in the law) can amend the constitution. Usually, the statute will set out model articles, which the corporation's constitution will be assumed to have if it is silent on a bit of particular procedure. The United States, and a few other common law countries, split the corporate constitution into two separate documents (the UK got rid of this in 2006). The memorandum of Association (or articles of incorporation) is the primary document, and will generally regulate the company's activities with the outside world. It states which objects the company is meant to follow (e.g. "this company makes automobiles") and specifies the authorised share capital of the company. The articles of association (or by-laws) is the secondary document, and will generally regulate the company's internal affairs and management, such as procedures for board meetings, dividend entitlements etc. In the event of any inconsistency, the memorandum prevails and in the United States only the memorandum is publicised. In civil law jurisdictions, the company's constitution is normally consolidated into a single document, often called the charter. It is quite common for members of a company to supplement the corporate constitution with additional arrangements, such as shareholders' agreements, whereby they agree to exercise their membership rights in a certain way. Conceptually a shareholders' agreement fulfills many of the same functions as the corporate constitution, but because it is a contract, it will not normally bind new members of the company unless they accede to it somehow. One benefit of shareholders' agreement is that they will usually be confidential, as most jurisdictions do not require shareholders' agreements to be publicly filed. Another common method of supplementing the corporate constitution is by means of voting trusts, although these are relatively uncommon outside the United States and certain offshore jurisdictions. Some jurisdictions consider the company seal to be a part of the "constitution" (in the loose sense of the word) of the company, but the requirement for a seal has been abrogated by legislation in most countries. The most important rules for corporate governance are those concerning the balance of power between the board of directors and the members of the company. Authority is given or "delegated" to the board to manage the company for the success of the investors. Certain specific decision rights are often reserved for shareholders, where their interests could be fundamentally affected. There are necessarily rules on when directors can be removed from office and replaced. To do that, meetings need to be called to vote on the issues. How easily the constitution can be amended and by whom necessarily affects the relations of power. (a) The business and affairs of every corporation organized under this chapter shall be managed by or under the direction of a board of directors, except as may be otherwise provided in this chapter or in its certificate of incorporation. In Germany, §76 AktG says the same for the management board, while under §111 AktG the supervisory board's role is stated to be to "oversee" (überwachen). In the United Kingdom, the right to manage is not laid down in law, but is found in Part.2 of the Model Articles. This means it is a default rule, which companies can opt out of (s.20 CA 2006) by reserving powers to members, although companies rarely do. UK law specifically reserves shareholders right and duty to approve "substantial non cash asset transactions" (s.190 CA 2006), which means those over 10% of company value, with a minimum of £5,000 and a maximum of £100,000. Similar rules, though much less stringent, exist in §271 DGCL and through case law in Germany under the so-called Holzmüller-Doktrin. Probably the most fundamental guarantee that directors will act in the members' interests is that they can easily be sacked. During the Great Depression, two Harvard scholars, Adolf Berle and Gardiner Means wrote The Modern Corporation and Private Property, an attack on American law which failed to hold directors to account, and linked the growing power and autonomy of directors to the economic crisis. In the UK, the right of members to remove directors by a simple majority is assured under s.168 CA 2006 Moreover, Art.21 of the Model Articles requires a third of the board to put themselves up for re-election every year (in effect creating maximum three year terms). 10% of shareholders can demand a meeting any time, and 5% can if it has been a year since the last one (s.303 CA 2006). In Germany, where employee participation creates the need for greater boardroom stability, §84(3) AktG states that management board directors can only be removed by the supervisory board for an important reason (ein wichtiger Grund) though this can include a vote of no-confidence by the shareholders. Terms last for five years, unless 75% of shareholders vote otherwise. §122 AktG lets 10% of shareholders demand a meeting. In the US, Delaware lets directors enjoy considerable autonomy. §141(k) DGCL states that directors can be removed without any cause, unless the board is "classified", meaning that directors only come up for re-appointment on different years. If the board is classified, then directors cannot be removed unless there is gross misconduct. Director's autonomy from shareholders is seen further in §216 DGCL, which allows for plurality voting and §211(d) which states shareholder meetings can only be called if the constitution allows for it. The problem is that in America, directors usually choose where a company is incorporated and §242(b)(1) DGCL says any constitutional amendment requires a resolution by the directors. By contrast, constitutional amendments can be made at any time by 75% of shareholders in Germany (§179 AktG) and the UK (s.21 CA 2006). In most jurisdictions, directors owe strict duties of good faith, as well as duties of care and skill, to safeguard the interests of the company and the members. In many developed countries outside the English speaking world, company boards are appointed as representatives of both shareholders and employees to "codetermine" company strategy. Corporate law is often divided into corporate governance (which concerns the various power relations within a corporation) and corporate finance (which concerns the rules on how capital is used). "A corporate body can only act by agents, and it is, of course, the duty of those agents so to act as best to promote the interests of the corporation whose affairs they are conducting. Such agents have duties to discharge of a fiduciary nature towards their principal. And it is a rule of universal application that no one, having such duties to discharge, shall be allowed to enter into engagements in which he has, or can have, a personal interest conflicting or which possibly may conflict, with the interests of those whom he is bound to protect... So strictly is this principle adhered to that no question is allowed to be raised as to the fairness or unfairness of the contract entered into..."
The standard of skill and care that a director owes is usually described as acquiring and maintaining sufficient knowledge and understanding of the company's business to enable him to properly discharge his duties. This duty enables the company to seek compensation from its director if it can be proved that a director has not shown reasonable skill or care which in turn has caused the company to incur a loss. In many jurisdictions, where a company continues to trade despite foreseeable bankruptcy, the directors can be forced to account for trading losses personally. Directors are also strictly charged to exercise their powers only for a proper purpose. For instance, were a director to issue a large number of new shares, not for the purposes of raising capital but in order to defeat a potential takeover bid, that would be an improper purpose. Ronald Coase has pointed out, all business organizations represent an attempt to avoid certain costs associated with doing business. Each is meant to facilitate the contribution of specific resources - investment capital, knowledge, relationships, and so forth - towards a venture which will prove profitable to all contributors. Except for the partnership, all business forms are designed to provide limited liability to both members of the organization and external investors. Business organizations originated with agency law, which permits an agent to act on behalf of a principal, in exchange for the principal assuming equal liability for the wrongful acts committed by the agent. For this reason, all partners in a typical general partnership may be held liable for the wrongs committed by one partner. Those forms that provide limited liability are able to do so because the state provides a mechanism by which businesses that follow certain guidelines will be able to escape the full liability imposed under agency law. The state provides these forms because it has an interest in the strength of the companies that provide jobs and services therein, but also has an interest in monitoring and regulating their behaviour. Members of a company generally have rights against each other and against the company, as framed under the company's constitution. However, members cannot generally claim against third parties who cause damage to the company which results in a diminution in the value of their shares or others membership interests because this is treated as "reflective loss" and the law normally regards the company as the proper claimant in such cases. In relation to the exercise of their rights, minority shareholders usually have to accept that, because of the limits of their voting rights, they cannot direct the overall control of the company and must accept the will of the majority (often expressed as majority rule). However, majority rule can be iniquitous, particularly where there is one controlling shareholder. Accordingly, a number of exceptions have developed in law in relation to the general principle of majority rule. Each has relative advantages and disadvantages, both at law and economically. Additional methods of raising capital necessary to finance its operations is that of retained profits Various combinations of financing structures have the capacity to produce fine-tuned transactions which, using the advantages of each form of financing, support the limitations of the corporate form, its industry, or economic sector.. A mix of both debt and equity is crucial to the sustained health of the company, and its overall market value is independent of its capital structure. One notable difference is that interest payments to debt is tax deductible whilst payment of dividends are not, this will incentivise a company to issue debt financing rather than preferred shares in order to reduce their tax exposure. Companies may issue different types of shares, called "classes" of shares, offering different rights to the shareholders depending on the underlying regulatory rules pertaining to corporate structures, taxation, and capital market rules. A company might issue both ordinary shares and preference shares, with the two types having different voting and/or economic rights. It might provide that preference shareholders shall each receive a cumulative preferred dividend of a certain amount per annum, but the ordinary shareholders shall receive everything else. Corporations will structure capital raising in this way in order to appeal to different lenders in the market by providing different incentives for investment. The total value of issued shares in a company is said to represent its equity capital. Most jurisdictions regulate the minimum amount of capital which a company may have, although some jurisdictions prescribe minimum amounts of capital for companies engaging in certain types of business (e.g. banking, insurance etc.). Similarly, most jurisdictions regulate the maintenance of equity capital, and prevent companies returning funds to shareholders by way of distribution when this might leave the company financially exposed. Often this extends to prohibiting a company from providing financial assistance for the purchase of its own shares. Events such as mergers, acquisitions, insolvency, or the commission of a crime will adversely affect the corporation in its current form. At the end of the corporate lifecycle, a corporation may be "wound up" and enter into bankruptcy liquidation. This often arises when the corporation is unable to discharge its debts in a timely manner. Comparatively, a merger or acquisition can often mean the altering or extinguishing of the corporation. In addition to the creation of the corporation, and its financing, these events serve as a transition phase into either dissolution, or some other material shift. Liquidation is the normal means by which a company's existence is brought to an end. It is also referred to (either alternatively or concurrently) in some jurisdictions as winding up or dissolution. Liquidations generally come in two forms — either compulsory liquidations (sometimes called creditors' liquidations) and voluntary liquidations (sometimes called members' liquidations, although a voluntary liquidation where the company is insolvent will also be controlled by the creditors, and is properly referred to as a creditors' voluntary liquidation). Where a company goes into liquidation, normally a liquidator is appointed to gather in all the company's assets and settle all claims against the company. If there is any surplus after paying off all the creditors of the company, this surplus is then distributed to the members. As its names imply, applications for compulsory liquidation are normally made by creditors of the company when the company is unable to pay its debts. However, in some jurisdictions, regulators have the power to apply for the liquidation of the company on the grounds of public good, i.e., where the company is believed to have engaged in unlawful conduct, or conduct which is otherwise harmful to the public at large. Voluntary liquidations occur when the company's members decide voluntarily to wind up the affairs of the company. This may be because they believe that the company will soon become insolvent, or it may be on economic grounds if they believe that the purpose for which the company was formed is now at an end, or that the company is not providing an adequate return on assets and should be broken up and sold off. Some jurisdictions also permit companies to be wound up on "just and equitable" grounds. Generally, applications for just and equitable winding-up are brought by a member of the company who alleges that the affairs of the company are being conducted in a prejudicial manner, and asking the court to bring an end to the company's existence. For obvious reasons, in most countries, the courts have been reluctant to wind up a company solely on the basis of the disappointment of one member, regardless of how well-founded that member's complaints are. Accordingly, most jurisdictions that permit just and equitable winding up also permit the court to impose other remedies, such as requiring the majority shareholder(s) to buy out the disappointed minority shareholder at a fair value. Insider trading is the trading of a corporation's stock or other securities (e.g., bonds or stock options) by individuals with potential access to non-public information about the company. In most countries, trading by corporate insiders such as officers, key employees, directors, and large shareholders may be legal if this trading is done in a way that does not take advantage of non-public information. However, the term is frequently used to refer to a practice in which an insider or a related party trades based on material non-public information obtained during the performance of the insider's duties at the corporation, or otherwise in breach of a fiduciary or other relationship of trust and confidence or where the non-public information was misappropriated from the company. Illegal insider trading is believed to raise the cost of capital for securities issuers, thus decreasing overall economic growth. In the United States, most corporations are incorporated, or organized, under the laws of a particular state. The laws of the state of incorporation normally governs a corporation's internal operations, even if the corporation's operations take place outside that state. Corporate law differs from state to state. Because of these differences, some businesses will benefit from having a corporate lawyer determine the most appropriate or advantageous state in which to incorporate. Business entities may also be regulated by federal laws and in some cases by local laws and ordinances. A majority of publicly traded companies in the U.S. are Delaware corporations. Some companies choose to incorporate in Delaware because the Delaware General Corporation Law offers lower corporate taxes than many other states. Many venture capitalists prefer to invest in Delaware corporations. Also, the Delaware Court of Chancery is widely recognized as a good venue for the litigation of business disputes. ^ RC Clark, Corporate Law (Aspen 1986) 2; H Hansmann et al, Anatomy of Corporate Law (2004) ch 1 set out similar criteria, and in addition state modern companies involve shareholder ownership. However this latter feature is not the case in many European jurisdictions, where employees participate in their companies. ^ Phillip I. Blumberg, The Multinational Challenge to Corporation Law: The Search for a New Corporate Personality, (1993) has a very good discussion of the controversial nature of additional rights being granted to corporations. ^ In England the first joint stock company was the East India Company, which received its charter in 1600. 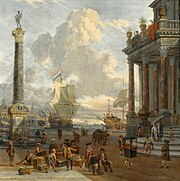 The Dutch East India Company received its charter in 1602, but is generally recognized as the first company in the world to issue joint stock. Not coincidentally, the two companies were competitors. ^ "Long ago, the region's failure to develop joint-stock companies was one reason why it fell behind the West." from "Think local". The Economist. ^ Salomon v. Salomon & Co.  AC 22. ^ Although it did attach to documents within the husband's custody or control. ^ "TITLE 8 - CHAPTER 1. GENERAL CORPORATION LAW - Subchapter IV. Directors and Officers". delcode.delaware.gov. ^ See also, Listing Rule 10 for public companies, setting out a scale of transactions requiring shareholder approval and disclosure. ^ c.f. Bushell v. Faith, and query whether the decision would still be decided the same way. ^ See also, SEC 13d-5, dating from times when groups of investors were considered potential cartels, saying any 5% shareholder voting block must register with the Federal financial authority, the Securities and Exchange Commission. ^ Though the Constitution may allow particular provisions to be further "entrenched", s.22; Furthermore, Art.3 of the Model Articles allows 75% of members in general meeting to give the directors specific instructions. ^ Hans-Joachim Mertens; Erich Schanze (1979). "The German Codetermination Act OF 1976" (PDF). Journal of Comparative Corporate Law and Securities Regulation. North-Holland Publishing Company. 2: 75–88. ^ Larson, Aaron (20 July 2016). "Where To Incorporate Your Business". ExpertLaw.com. Retrieved 3 April 2018. ^ "Corporations". Wex. Cornell Law School. Retrieved 3 April 2018. ^ Salkin, Patricia E. (2008). "Municipal Regulation of Formula Businesses". Case Western Reserve Law Review. 58 (4): 1251. Retrieved 3 April 2018. ^ "About the Division of Corporations". Delaware Division of Corporations. Retrieved 3 April 2018. ^ Tarver, Evan (2015-09-25). "4 Reasons Why Delaware Is Considered a Tax Shelter". Investopedia. Retrieved 2017-08-19. ^ Feldman, Sandra (17 May 2017). "Choice of Entity for Startups Seeking Venture Capital". Wolters Kluwer. CT Corporation System. ^ Quillen, William T.; Hanrahan, Michael (1992). "A Short History of the Court of Chancery". Delaware Court of Chancery. Retrieved 3 April 2018. This page was last edited on 9 April 2019, at 17:37 (UTC).